The antique Italian pottery and the art of Italian ceramics are famous in the world for the quality of the ornament and the variety of the forms. The most antique Italian pottery were already realized during the pre-Roman period with such refined techniques that they could express in the ceramics and in the antique glazes an art and a taste for the representation of life scenes and also of abstract geometrical decorations. 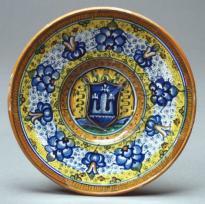 The art of antique Italian ceramics is marked by the historic and social evolution of the country; the ceramics, like the other most important arts, sees during the communal period the multiplication of styles provoked by the requirement of each communal center to define a proper identity as artistic as governmental. Probably, for the earthenware and for the Italian ceramics in general, the strongest moment of evolution is marked by the Italian ceramics of the Renaissance; in fact, this one, due to the development of philosophy and therefore of the way of considering relations between the immanent and the spiritual, sees the interruption in the glazes of the Italian ceramics and of the artistic earthenware, of colors, scenes, animated and multicolored forms. (Note: For the precision, when we talk about "earthenware" we mean the ceramic products formed from porous pastes based on clay and small quantities of carbonate of calcium cooked in the oven and covered with a special metallic glaze based on dioxide of tin). The antique Italian Renaissance ceramics, however, do not forget the classical background for what is concerning the study of spaces and the organic character of the equipment represented. Nowadays, the antique Italian ceramics is seeing new splendors thanks to the work of enterprises that are collecting all around Italy the antique original prints in order to realize the same ornaments that were making precious the earthenware of the past centuries, and also thanks to the interest in the use of earthenware of some famous architects (among whom also Renzo Piano). Therefore it is absolutely necessary, for who is so fortunate to visit Umbria, to stop in the enterprises and in the shops specialized in that kind of production. Those who, on the contrary, can not profit now from a holidays in this region, will find a valid online shop with a large choice on our site, in such a way that besides the fact that they can not personally discover the secrets of the art of modeling and cooking from the clay, they can at least admire it directly in their own houses.